When Virginia Carson arrived in Coffee County in the spring of 2008, the then-interim president of South Georgia State College was struck by the instant acceptance she received from the region’s political, business and community leaders. “I was very warmly welcomed, and it was clear to me that the community recognized the importance of the college both economically and in terms of quality of life,” says Carson, who was named president in January 2009. A Macon native who spent years working as a professor and administrator at Georgia Perimeter College in Clarkston and Georgia Highlands College in Rome, she is far from the only person who gushes when the subject of Coffee County’s community spirit comes up. 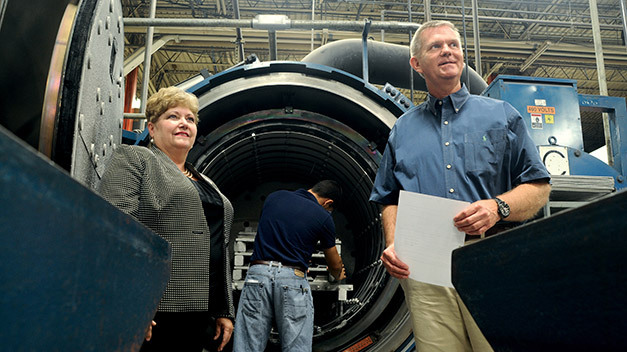 “Coffee County is truly a rare gem because it is progressive and it doesn’t want to settle for the status quo,” says Scott Smith, human resources manager for PCC Airfoils, a manufacturer of jet engine parts. Like Carson, Smith has lived and worked in other places, but he believes the people and communal sense of collaboration make Coffee County and the city of Douglas stand out from other municipalities in Georgia and across the Southeast. Located in southeast Georgia, Coffee County shares borders with eight counties (Atkinson, Bacon, Ben Hill, Berrien, Irwin, Jeff Davis, Telfair and Ware). Although the county is accessible by three U.S. highways and numerous state routes, it is not on any of the major interstates that bisect south Georgia. Thus, local officials must get creative in order to attract site selectors from regional and national corporations. “They have all kinds of [computer] programs where they can look and get everything they want to know about Douglas,” says JoAnne Lewis, president of the Douglas-Coffee County Chamber of Commerce and Economic Development Authority. In order to convince prospective companies to visit Coffee County and Douglas, Lewis and her staff exhaust every available avenue. This includes making frequent trips to Atlanta, which is just over 200 miles from Douglas, and getting executives from companies with locations in the county such as PCC Airfoils and Douglas Southwire to aid in selling the area to their counterparts at other companies. Understanding the long-term benefits of a quality workforce is one of the reasons for several expansions in education within the county at the secondary school and college levels. Since accepting the county’s school superintendent position in the summer of 2011, Dr. Morris Leis has worked alongside city and county officials, business leaders and the administrations of South Georgia State College and Wiregrass Georgia Technical College (WGTC) to improve the area’s public schools and provide additional career development opportunities for high school students. Perhaps the most significant change occurred last fall when the Coffee County Career Academy opened its doors. Functioning as an alternative to Coffee County High School, the career academy allows students in grades nine through 12 the opportunity to progress toward a high school diploma through a blended model of online learning and the traditional classroom. Students can get training for specific careers through partnerships with local businesses, participate in dual enrollment programs with Wiregrass Technical College or take an accelerated path toward a high school diploma. At the conclusion of its first school year in May, the career academy boasted an enrollment of approximately 220 students, according to Leis, and 14 students graduated. “It allows flexibility, and they can master content at their own pace,” Leis says. Although the career academy is currently housed in Coffee County High School’s former building, it will move into a new facility on the campus of WGTC. A $3.15-million grant from the State Board of the Technical College System of Georgia will go toward construction of the new facility. The groundbreaking ceremony for the new career academy is expected to take place by the start of 2015. In addition to the career academy, the county’s Board of Education has plans for several other new facilities. In November, an education Special Purpose Local Option Sales Tax (E-SPLOST) initiative passed with nearly 80 percent of the vote. The new E-SPLOST is expected to provide approximately $28 million in funding from 2015 through 2020, according to Leis, with some of those funds slated for construction of an agricultural center, a 1,000-seat performing arts center at Coffee County High School and a new elementary school. Outside of improvements in public education facilities, the county will open a new Boys and Girls Club this month. At a retreat several years ago, the Douglas-Coffee chamber’s Leadership Development Committee decided the addition of a Boys and Girls Club would be a major asset in terms of workforce development. In preparation for the new Boys and Girls Club, the committee has raised more than $200,000. A large chunk of funding for the Club was generated in a “Dancing with the Stars” fundraiser in May. Inspired by the popular ABC dance competition show, teams of local business and community leaders competed against each other and raised more than $40,000 toward the project. The new Boys and Girls Club and the county’s STEM program, in which high school students with strong skills in science, technology, engineering and math hone their talents through internships with local companies, are viewed as vital components to the future of Coffee County’s economy. The county’s two colleges, WGTC and South Georgia State College, are also expanding. In 2011, the Board of Regents granted state college status to South Georgia, which allowed the school, the first state-supported two-year college in Georgia, to offer bachelor’s degree programs. Following a consolidation with Waycross College two years later, the school was re-named South Georgia State College. With an enrollment of nearly 2,700 students, the college operates campuses in Douglas and Waycross and has satellite partnerships with Valdosta State University in Valdosta and Georgia Southwest-ern State University in Americus. Although the majority of academic programs at South Georgia State lead to associate degrees, the college’s first group of 24 four-year nursing students graduated in May. The college will introduce its second bachelor’s degree program this fall in biological science, which includes a track in nature and ecology as well as a pre-professional track. With students hailing from 109 of Georgia’s 159 counties as well as 28 states and 18 countries, South Georgia seems poised for growth. Coffee Regional Medical Center (CRMC) is one of the chief beneficiaries of South Georgia’s new nursing bachelor’s degree program. Graduates from the new program, along with students who complete WGTC’s practical nursing program, provide a wealth of capable nurses for the hospital. A steady stream of local nurses coupled with a group of experienced physicians has helped the hospital earn accolades from a variety of sources, including Becker’s Hospital Review, which ranked CRMC first in the state and 11th in the nation in Highest Value-Based Purchasing Scores for the 2014 fiscal year. The magazine’s ranking system assesses hospitals in three areas: clinical process care, patient experience of care and outcomes. Nearly 3,000 hospitals across the nation were included in the magazine’s survey. One of the most encouraging signs of economic progress in Douglas-Coffee is the number of development projects that are underway. Douglas Southwire, a division of the Carrollton-based wire producer that has operated a plant in Coffee County since 2006, recently opened a second facility in the county. The company has invested $18.5 million in the new plant, which began production in November 2013. At the moment, it employs six, but that number is expected to increase to 25 or 30 over the next few years, according to Gary Evans, plant manager of Douglas Southwire. In addition to Douglas Southwire, four other existing businesses – Spectrum Distribution, Elixir Industries, Sunbelt Greenhouses and Fleetwood Homes Inc. – announced or completed expansions between January 2013 and May 2014. “That’s huge for us,” the chamber’s JoAnne Lewis says. Additionally, construction began on a Marriott hotel in Douglas. The project is expected to create 45 jobs and bring two national franchise restaurants to the area. The positive momentum in Douglas and Coffee County is a far cry from where the area was just a few years ago from a business and economic development standpoint. At the end of 2008, Pilgrim’s Pride, a poultry processing plant that employed 900 workers, announced plans to close. When the plant closed in 2009, the county’s unemployment rate surged to 19.4 percent. Since then, the county has bounced back thanks to the re-opening of Pilgrim’s under new ownership and an aggressive plan for future economic development. Today, the county’s unemployment rate is just over 9 percent and the county has acquired two tracts of land for industrial parks, one of which was paid for with approximately $1.6 million from private fundraising efforts. Douglas Mayor James Dennis credits collaboration among city and county government officials and business leaders, along with a commitment to education and workforce development for putting the area on the path to growth.